>What a beautiful day. I call this a Goldilocks day- not too hot, just right, not too bright, just right! Thanks again to all that have encouraged us to get back to this blog thing. Those of you that know me, know how much I resist this technology thing but I missed putting down my ideas and thoughts, so here we are again! Ce cilia and I want to mention just a few things that are new. First, the new Knitter’s magazine looks like a winner. Great new spring and summer, short and long sleeve offerings for all tastes, shapes and sizes. New sock books are in. 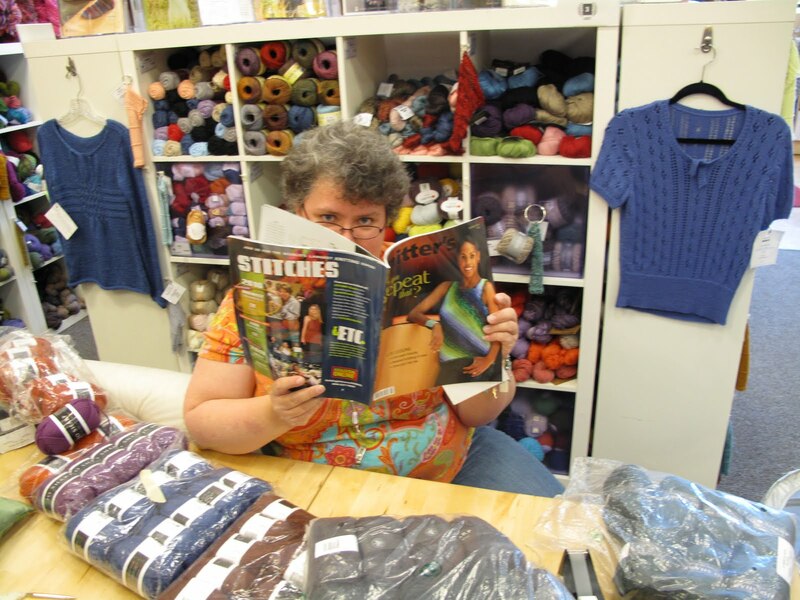 We have one for beginners or an intermediate sock knitter’s reference book. It’s called “The Sock Knitter’s Workshop” by Ewa Jostes and Stephanie van der Linden. The other new sock book is “Toe-up 2-at-a-Time Socks” by Melissa Morgan Oakes. This one has great pictures for this technique plus some patterns using this intriguing method. The summer yarn of choice this season seems to be anything basic and 100% cotton or cotton blend. The shop has everything to knit the summer pattern you’ve been dying to try. Come in the shop and see the Berocco summer short sleeved top Jane will be teaching – it’s perfect for an evening out or just worn with jeans. I cast on for a new scarf and I thought it would be fun to share its progress with you. It’s called the Challah Infinity Scarf. 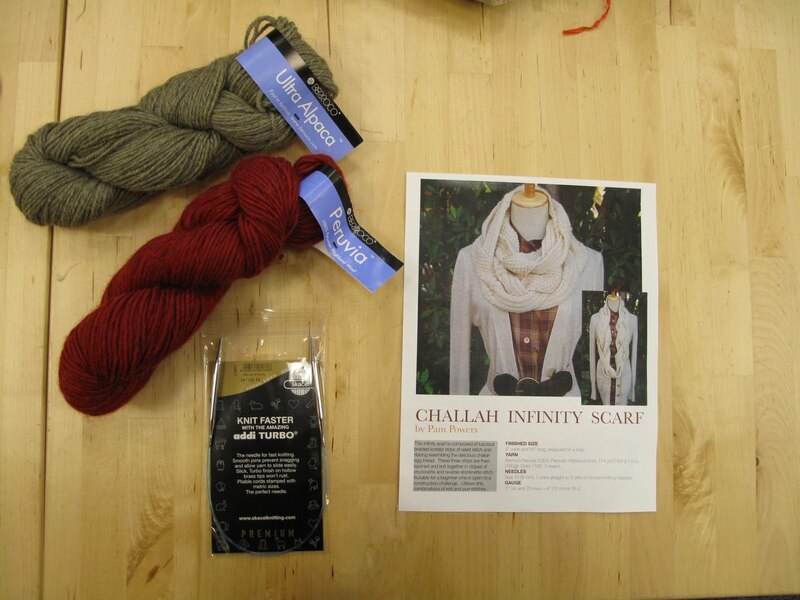 Below is a photo of the materials used, plus color and yarn options. 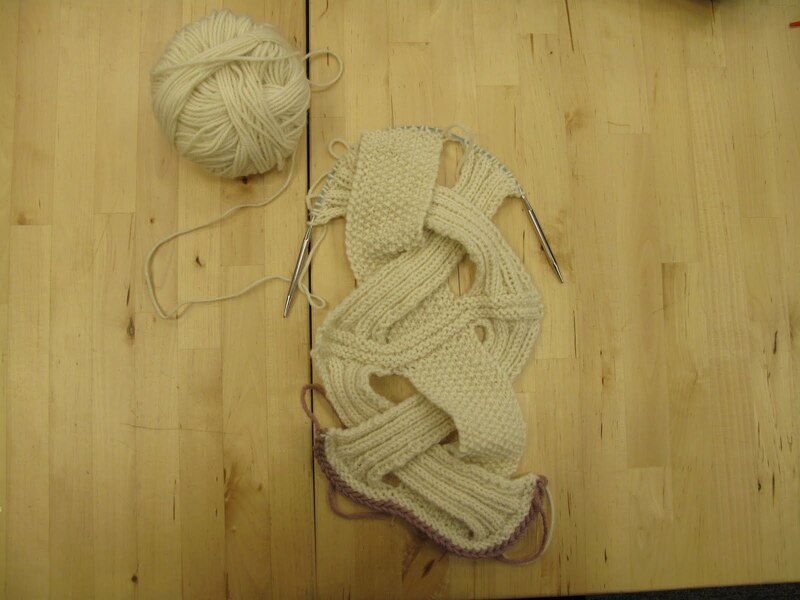 The second photo is the scarf in progress. I cast on invisibly so that I can Kitchener it together. The pattern says you need 3 needles, 16” long – 1 for each braid but, you only need 1 needle and some stitch holders – otherwise, it’s been a treat to knit and I am finding the braiding part fun to do. Is there a small, portable project that you have been dying to try? Perhaps we can do it together. Just drop the shop an e-mail and we’ll see what you all are interested in. Everyone here at 3K wants to wish you all a happy and safe Memorial Day. We hope you spend it with your family and friends, eating good grilled fare and get those summer tans started. (Although, I do have to tell you to wear sunscreen!. The Shop will be closed on Monday. Happy Birthday to Tiffany – love and miss you!!! Happy Birthday to me – I think I am getting an i-pad – gotta get into this technology thing sometime – somehow!!! 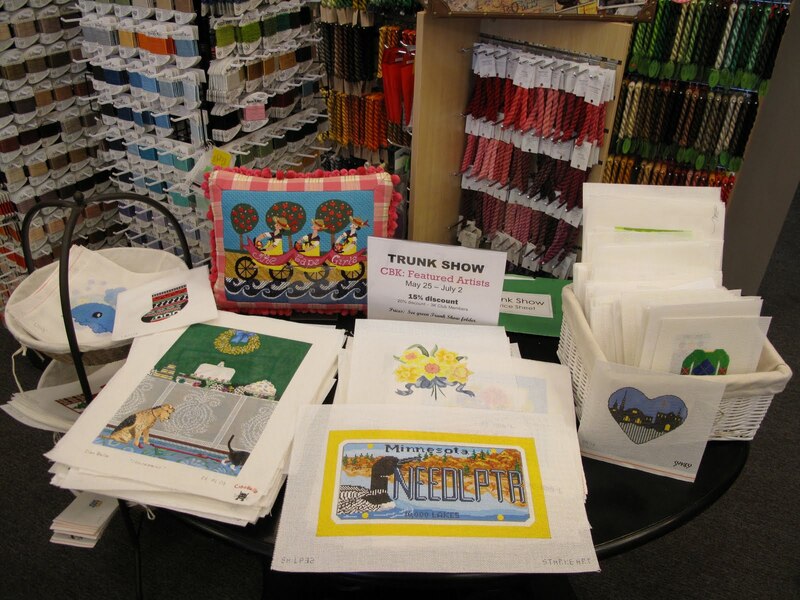 There is a really GREAT new needlepoint trunk show from CBK. They are a collection of designers ranging in theme, size and price. It’s here until July 2! >Bummer – you always seem to close on those days that I'm able to talk hubby into taking me 😦 Have you all gotten tatting shuttles in yet? I prefer the small clovers with the sharp point and I can't find them ANYWHERE (I've check the other spots in the area, no luck) — PLEASE don't let this art die! >Ginger, I'm not sure if we have any of the Clover tatting shuttles in stock, but we can always order them for you. We order from our Clover vendor twice each month – and this week I'll be putting in an order with them. So call the store if you want us to order you one!